On the nearby island of Ometepe, by many measures more impoverished and certainly more isolated than San Juan, 75 women graduated from another three-year program in 2003. “Empowering Women Through Literacy” and all the subsequent continuing-education programs (the Free High School for Adults, the Technical Institute, the Computer School, and the micro-lending program) have been organized by Dr. Rosa Elena Bello, the visionary director of Community Medical Services. CMS is a not-for-profit public health and medical facility located in the heart of the port of San Juan del Sur. Rosa Elena Bello and the great-souled Dr. Patricia Claeys, for ten years the Florence Nightingale of San Juan, wrote the original proposal in Spanish. Margaret Morganroth Gullette, then a liaison from the Newton Sister City Project, co-wrote and translated the proposal and, after dozens of tries, found the funding. The Agostino Foundation, headed in 1997 by Marshall and Flavia Robinson, distinguished for their innovative assistance to indigenous women in Guatemala and the Yucatan, gave the venturesome grant for the first year of the program in San Juan and also for the last year in Ometepe. Rosa Elena hired three college-educated women to train the teachers and monitor the classes twice a month. 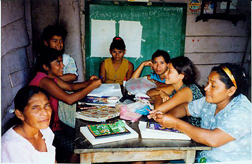 The goal of the programs was to reach illiterate women–among the most disadvantaged in Nicaragua, with no access to adult education and little or no prior access to elementary education–and to teach them reading, writing, numeracy, family planning, and health education, in their own barrios and villages, their supportive home places. The organizers hoped to strengthen their self-esteem and their gendered position in the family and society, by helping them understand the world around them. That seemed ambitious enough. But the plan was successful beyond their wildest dreams. By the time the women finished, 215 of the 246 women had earned a sixth-grade diploma awarded by the Ministry of Education. They took no vacations. Every one of them did in three years what it takes children six years to do in elementary school, while continuing to raise their families and–for most of them–do farm work as well. .
Thirty-three far-flung communities participated in San Juan’s literacy programs, and another eleven groups met on Ometepe. They met mostly in the women’s houses. A village needed to provide a certain number of students in order to have a classroom and a teacher approved. But no class could be bigger than ten. We wanted to provide individualized instruction. Some women had to carry their own chairs from home. Each “classroom” got its own blackboard. All the women got their own workbooks. Some lessons–like the words for the parts of the male and female body in the first-year workbook–were awkward. Englightenment and health were primary goals. 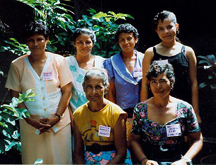 The San Juan programs involved women from 15 to 60. Most literacy campaigns around the world select out the older women, thinking to improve their retention statistics. Our model program in San Juan had an extraordinary retention rate, 82%. (Actually, women also entered the program, so we ended with as many women as had enrolled initially.) The Ometepe program’s retention was lower–68%–but most of the losses were due to growing economic hardship. The six best students. Two on right are an aunt and niece. In Nicaragua as elsewhere, adult education needs to have a component of gender empowerment. This is one of the Latin-American countries with high population growth. The macho man actualizes himself by having a big family and a subordinate wife. Some male partners have emigrated as economic conditions worsened, leaving many of the women students single heads-of-households, solteras. Most of the 33 teachers in the San Juan literacy program were already rural outreach health workers (brigadistas de salud), part of Community Medical Service’s team. 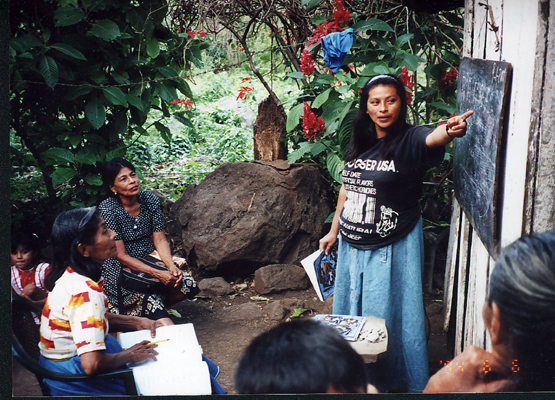 Like the eleven teachers in Ometepe, they lived in their villages, making each classroom a women’s center. All of them received minute salaries–$20 a month–but they welcomed the monthly trainings they received as teachers of literacy, gender, math, and eventually all the primary-school subjects. Some of them had only a primary-school certificate themselves. We recall how hard it was to recruit those hundreds of women students, many of them rural, who lived far from markets, banks, and shops –and scarcely knew other women who had finished grade school. The college-educated teachers went to the villages to convince them, often woman by woman. Women used all sorts of excuses, including their inability to learn. Those who joined were highly motivated. I met with five of the women in the clinic of Community Medical Services, after they had been in classes for maybe three months and had learned to write the alphabet. I asked them why they wanted to learn to read. “So as not to be cheated in the market,” one said. Another woman looked up at a public-health poster, full of cheerful colors, nice illustrations, and words of information. “To be able to read that!” she said. New students before they could read, discussing their reasons for entering the program. The literacy programs have elevated the ability of these three hundred women to participate in civil society and to be active on behalf of themselves and their families in matters of health, law, and economic development. Some of the teachers have gone on to the Free High School for Adults. Five of the original San Juan students have also completed the rigorous Free High School curriculum. Two have their photos on the FHS page. All the programs, taken together, have raised the quality of village and city life in countless ways. The fact that we have around 600 students in the Free High School each year, and that the demand grows each year, shows how much more prestige adult education has in San Juan del Sur than it had as recently as 1998.